Faith, hospitality, heritage and welcome. If you look at the tower now you will see it surrounded by a feat of engineering that has seen the entire tower surrounded by scaffolding. 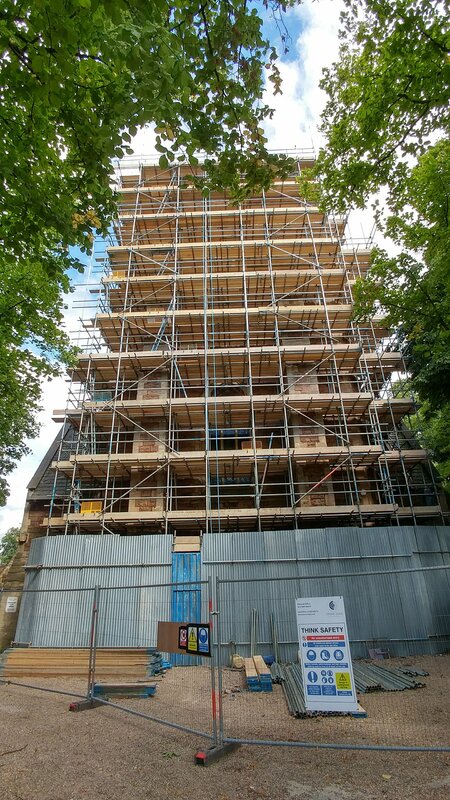 The scaffolding will enable the work to be completed safely and has taken so long because of how soft some of the stone is. Crafts people will now begin the careful work of restoration along with other vital work. Access to the church and halls is being maintained at all times. The church is open Tuesday from 9.30 and Wednesdays and Fridays, 11 to 1pm. Here is a reminder of the scaffolding being erected. And what we looked like before. If you have a safeguarding concern, then please contact our local Safeguarding Coordinator, Liz Gray, (via the Parish Office) or the parish priest. If you wish to speak to the Diocesan Safeguarding Team, or to someone outside the church, their contact details are available here.